Here is my first review, so be gentle. 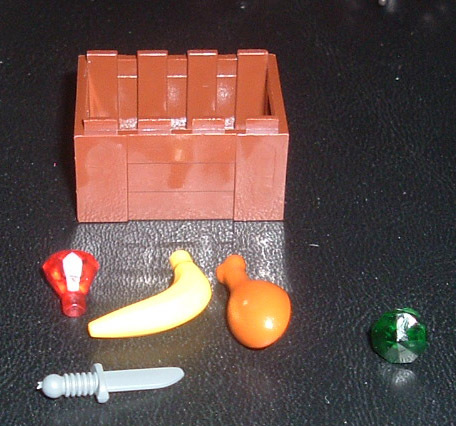 Top of box showing figs. As usual, the cover of the instruction booklet is the same as the box cover. 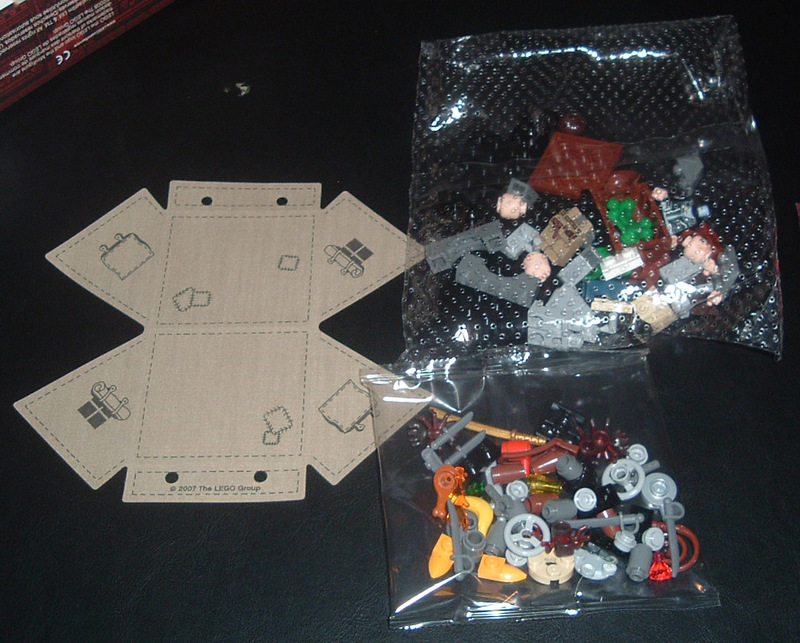 Here's the guts of the box, two bags of parts and the fabric tent cover. 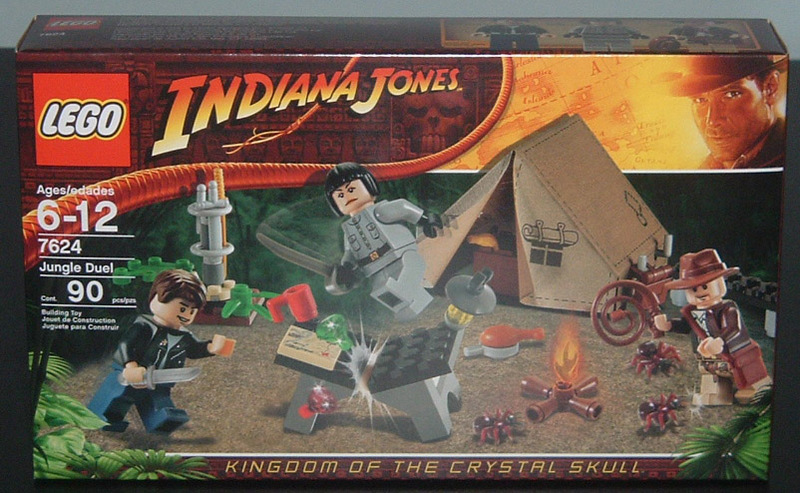 Indy has a new hairpiece in this set. Whoops! Guess I should've read the instructions before putting the minifigs together. Indy is the same as the first wave. No grey stubble on this 60 year-old adventurer! 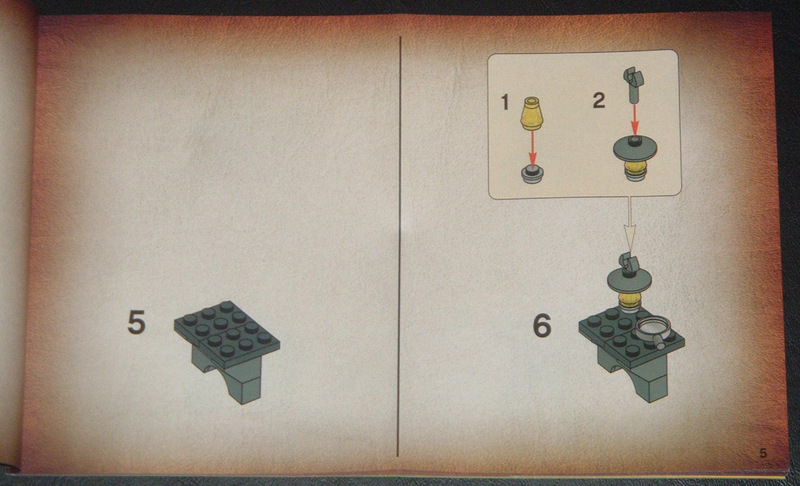 Here's a page from the instruction booklet. 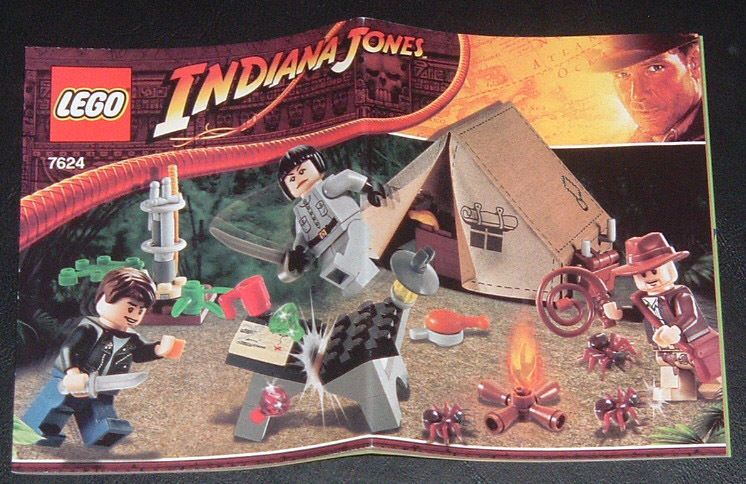 Nothing fancy, similar to the other Indy sets. 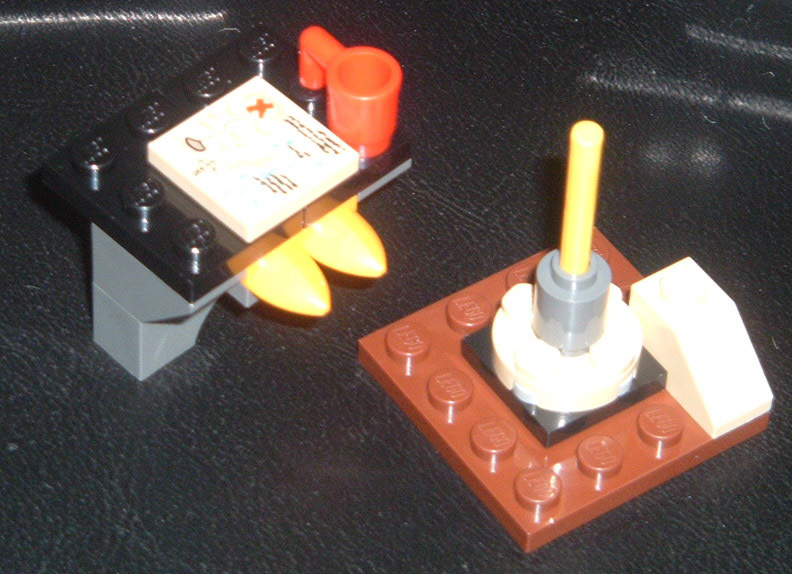 A couple yellow pieces that don't fit with the color scheme of the other sets. Once putting together the sword rack, the yellow lightsaber rod is not seen anymore. The two yellow teeth are only seen when the camp table is split. 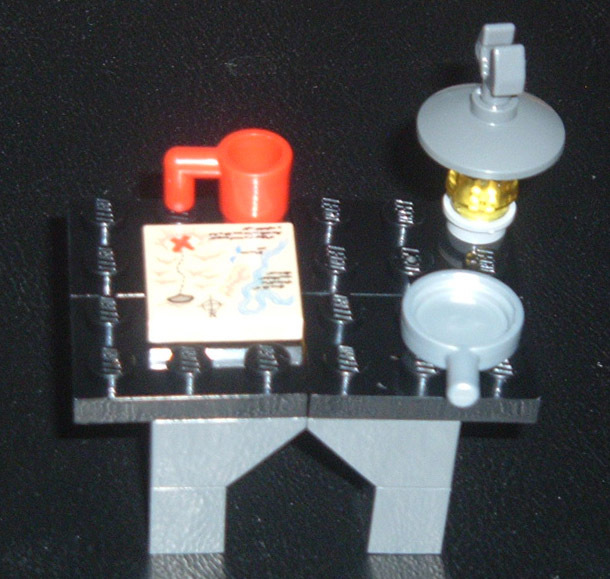 The camp table uses the teeth to sit atop a white 1x2 plate with door rail. Here is the table together. Here is the table split. The back of the tent. The bottom of the tent. I've never had a tent before so it would've been nice to have instruction to fold the tent cover sides along the pre-fabbed creases before putting the tent cover on. 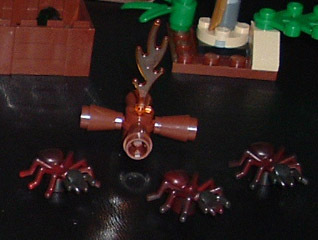 Close-up of the new ants and fire place. 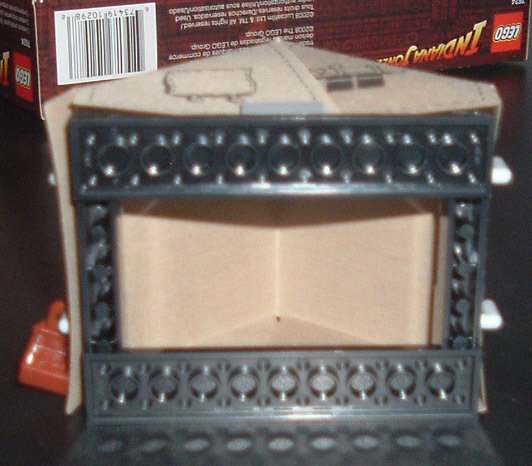 Fireplace and the two extra pieces of the set. The sword rack, that spins on a turntable. 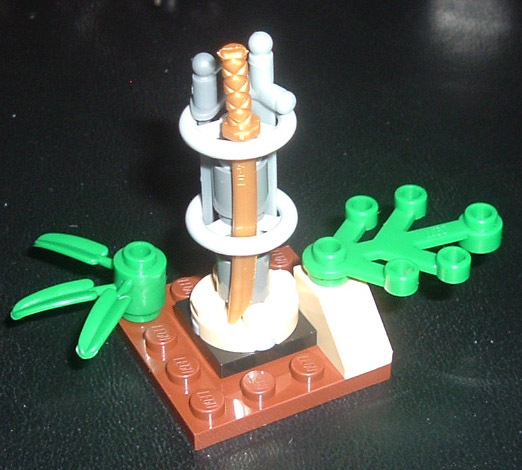 Minifigs with weapons, although the instructions don't actually show which blade goes with whom. Nothing really difficult with the build except for the tent cover issue mentioned earlier. The new female hair and face and nice. Now we have a non-smiling, non-scared female face. Believe Mutt's face and hair are new, but not sure. 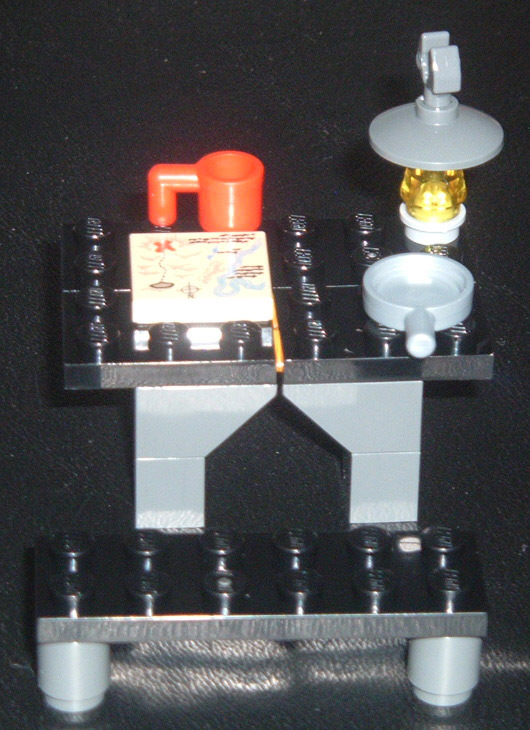 His torso is nice, and I'm glad it doesn't have any flesh, so it can be used for mini-fig MOCs easier. 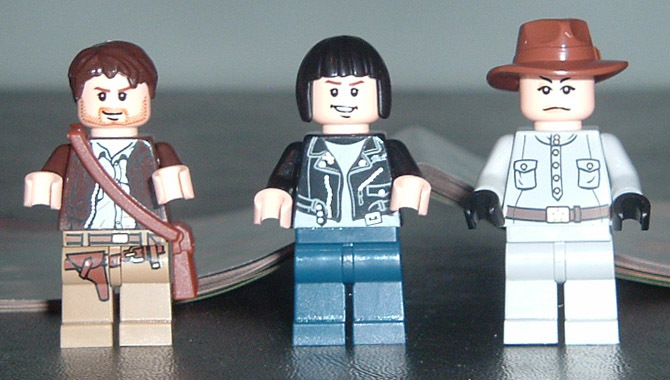 It would've been nice to have a different Indy, maybe one without his jacket or even have some grey in his stubble and eyebrows. The new ant pieces are cool. More creatures to be used in MOCs. About the only problem I saw was the break-apart table, which doesn't work to well. You actually have to slide the pieces apart a little to make to make them fall down. Not a big deal, though. Overall, a nice set with decent minifigs for the price. Posted the following info in the "New sets spotted" thread: Set was found at Wal-Mart mixed in with the Motorcyle Chase sets. It is a $10 set. Wal-Mart has it for $9.96. 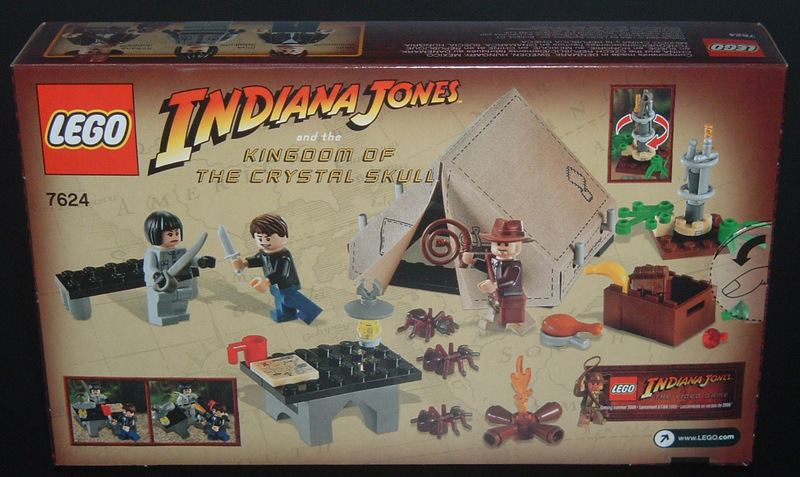 I also saw the Crystal Skull Temple set, two to be precise, but didn't buy that one. Where did you get that set ? Shouldn't that review be in the review forum ? Its really a great set and I do need several copies for a future layout !! I love the new parts: Irina nd Mutt's hairpiece, the bicolor ants. The set is great with nice accessories and loads of weapons: I'm happy they included a golden katana in that set since I didn't have one yet. The set as a whole looks great !! * another same Indy... G how many do we need ? Mutt Williams, eh? I wonder what that does to the theories that Mutt was Indy and Marian Ravenwood's son? I just saw this in the store today and was literally shivering. Thanks to my Dad for getting it for me with only a wee bit of grumbling. I didn't expect to see it in Singapore so soon! Here's the review. For the smallest set in the awesome new Crystal Skull range, this one sure packs some punch! 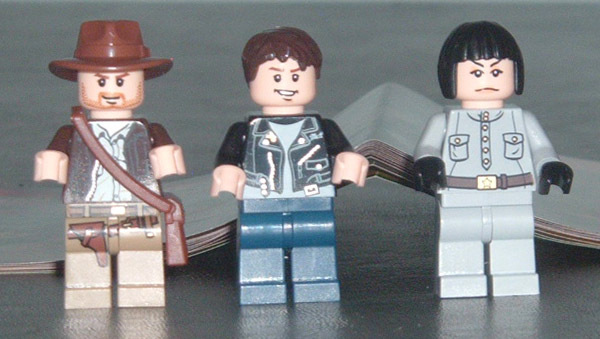 First of all, it's plenty value of money, containing three minifig representations of three of the main characters in the film. Irina Spalko and Mutt Williams also come with awesome new hairpieces. Also what's nice it that despite the relatively low piece count, this set looks like it includes quite a lot, which it does. 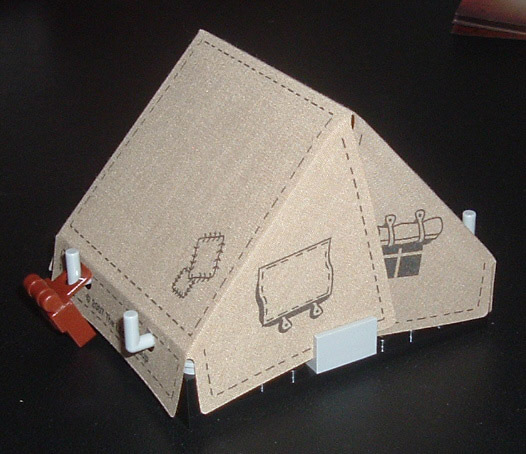 It's always to see another of the very rare tents, and all the accessories add a very cute touch as well. The new spiders (or are they ants? ), intricately desigined and amazingly coloured, look awesome, and it helps that there are three of them. 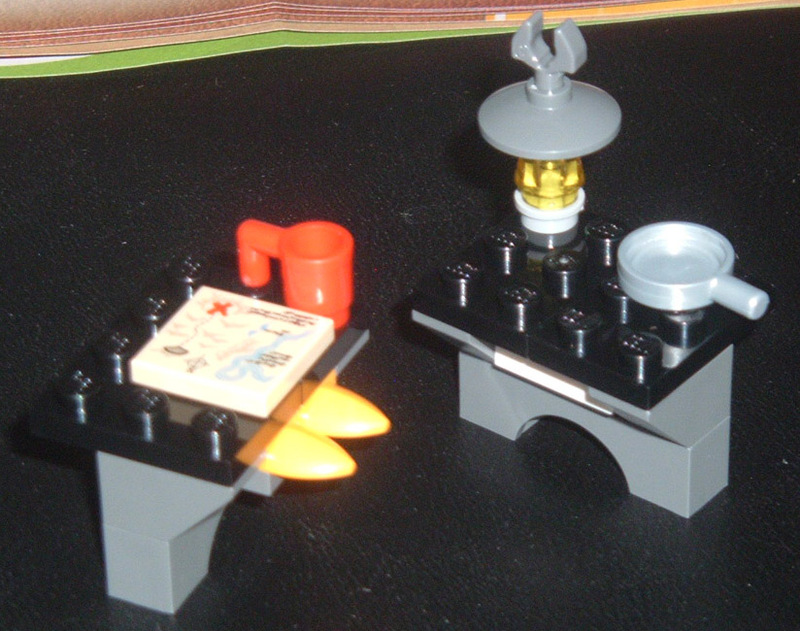 The table that breaks in half during battle is a nice touch too, and unlike many sets this size, it doesn't look very thrown together. This is a must-have if you're on a relatively tight budget for all its admirable aspects. Sorry to resurrect an old thread, but seemed the best place to ask this. I am getting ready to splurge on an Indy impulse set. Which one do you guys think I should get: This one, or 7620 Motorcycle Chase? I will likely get the other one for Christmas. Thanks in advance. Well, this is a tough question to answer. 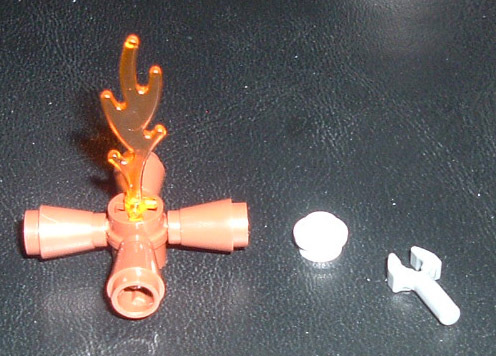 It all really boils down to what you want in each of the sets. I would get the jungle duel myself. It's much better for playability, and it has a lot of useful peices as well. Don't forget Motorcycle Chase also has the guard station and two of the new small cube-like crates (while Jungle Duel also has one of the older, larger crates, plus three ants). I have one of each myself, and personally intend to get more of both. I might suggest that if one were planning on getting one of them now and the other in a few months, that one start with Motorcycle Chase, on the grounds that it's been out longer (and hence might be deemed more likely to be discontinued sooner) - and more importantly, it takes place first (Motorcycle Chase covers a scene in 1938, while Jungle Duel covers one - well, a variation of a scene, anyway - in 1957). Well, I'm going to Wal-Mart this weekend. I intend to buy Jungle Duel, if they have it. I just thought that since this was the only set that I will get until Christmas, I want to get one with more central characters, and it seemed they had equal playability. I took both opinions into account, but I decided to take Flynn's advice. Thanks for responding! Okayyyyyyyy, strike what I said in the previous post. I am getting neither. Why? Because I saw Peril in Peru leave S@H, so I grabbed it up quick on toysrus.com. It should come in 6-9 business days from now. I'll do a review if there isn't one yet. P.S: Those who are afraid of my reviews because I include no pix, I will be sure to get a FlickR or Brickshelf THIS WEEKEND, before I get the set. 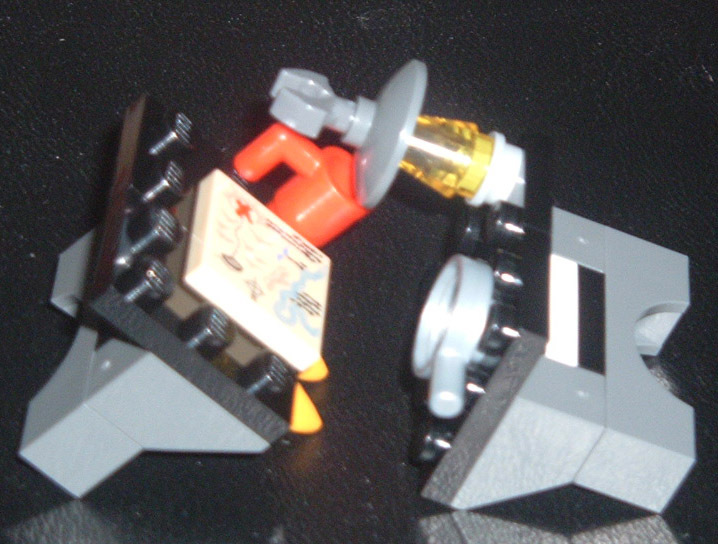 I will then add pix to my other two reviews, MagnaGuard Starfighter and UCS AT-ST.